It has been a year since I began my column with How to Spend It looking at value in menswear. Nice as it was, we had covered most of the basics – so the editors and I decided recently to change tack. The new column, The inside track, will look at one relatively unknown brand each month. It will combine a behind-the-scenes narrative with an insider’s explanation of the brand’s quality and originality. Hopefully, it will enable me to spread the word about many of the smaller producers that we know and love, but rarely get mainstream coverage. 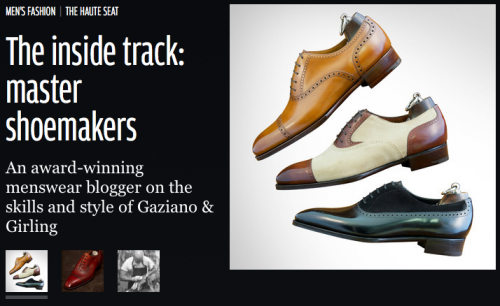 The first to be featured is Gaziano & Girling. Although well-known to shoe aficionados, few men outside the online world have heard of them. And they are on the cusp of something big, with a new factory and soon their very own shop. You can read old columns here. You can follow the discussion on The inside line: Gaziano & Girling in How to Spend It by entering your email address in the box below. You will then receive an email every time a new comment is added. These will also contain a link to a page where you can stop the alerts, and remove all of your related data from the site. The Second picture doesnt look like alligator! Nice write up, as always. However, the first shoe is a Kensington http://made-to-order.bespoke-england.co.uk/index.php?shoe=Kensington and the second one should be St. Ives. Simon, the first one is Kensington. Harrow as a swan neck. Sorry. My bad. Harrow it is.